Tim: Hey Doug, why don't you go work for Tesla for a few years. Find out everything that they know, then come back to us? Is overseeing production of the Tesla Model 3 supposed to be a recommendation? You got all that from sitting in it, huh? He felt the interior looked like a load of cheap plastic and feels it’s dangerous to use the screen for every single function within the car. Well, the latter was mentioned in reviews of the Model III. And yes, you can tell what a vehicle interior is like by sitting in it. You think an Apple car would be 2028? Interesting. Over 15K of the car (which currently starts at over $40K, after incentives) were sold in the US in July. That puts it well ahead of any sedan of comparable price, and in the same ballpark as the Civic, the top selling sedan in the US, despite that being available for half the price. So whoever is responsible for that certainly would be a good person to put in charge of putting a new vehicle into production. The only question is whether that person is Doug Field, Elon Musk, or someone else. It should be noted that production was only at 2K per month when Doug left but 3 months later it was at 15K - was it just that Doug had everything lined up for when Elon took over, or was it that Elon worked a miracle in the 3 months? We’ll probably find out in a few years when someone is doing research for a book or something. Yeap, I believe the model I was in, the sedan, starts from around 55k in the UK, that’s serious German make or Jaguar money. And when the build quality is poor at that price... not very impressive. As for the stupid interface, even Ford has usually done well with voice control, Mercedes uses it, BMW have inroduced hand features which work well. You look at the Range Rover with its dual screens, same issue as the Tesla. The same with Audi’s, the reviewers all say you have to take your eyes off the road! All though at least with Audi it’s Virtual Cockpit dash works very well and can display a lot of info, but that’s not controlling the cars features. Love the non-owners chiming in. All I can say is that the car is not only the funnest car I’ve bet driven, but is the fastest car on the road. After owning one for a year, I’ve never encountered another car that could beat me. Muscles cars, Porsche, you name it. Also it drives itself, literally. A guy I know took me out for a spin in his and yes, I can confirm that some drivers allow this to be a huge distraction. He spent less time looking at the road than he did at the screen, playing with it. Terrifying, even with all the driver aids. 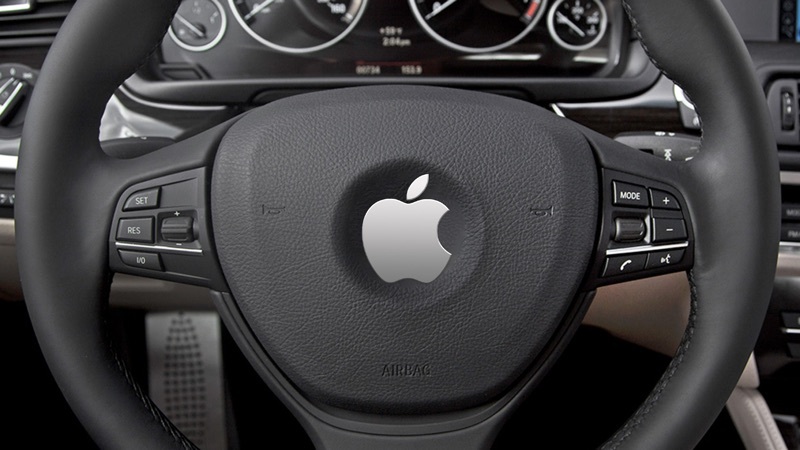 ...well, maybe Apple will fix the design of the button-covered steering wheels. Well, they will probably cover it in a touchpad with no tactile response, but hey it will look good. We have two cars now. I fully expect to be a single car family by 2022 and have a Lyft or Uber all-you-can-summon pass with a set amount of included miles monthly. It’s going to happen sooner than we think. One permanent SUV is all we’d need as a family, the summoned car would basically just take me the 10 minute ride to and from work. If it’s anything like the Tesla cars it won’t be very good! I sat in one for the first time and I just thought cheap plastic everywhere, not very well made, and a ridiculous giant screen that’s not easy to use at all, not a patch on a phone, and it’s just a distraction as you have to use it for everything taking your eyes off the road. Overpriced dangerous rubbish I thought. It needs to drive itself just to you can adjust the aircon! I hope he doesn’t do the same to this Apple project..
Couldn't disagree more. I own a Tesla Model 3. Most of my family drives Mercedes but I love the minimalist interior in my car. The lack of switches everywhere is the opposite of distracting. And the way the car is set up, the driver seat is almost pushed forward so you have a better view of the road then most sedans. It's hard to describe. And I personally love the screen. I don't even think about fiddling with my phone because everything I want is right there - music, maps, podcasts, etc. And the car drives AMAZING. Anyone who has floored it in a Tesla knows what I am talking about. It's so much fun. It's like having a roller coaster at your disposal. No clue on what they are doing, but in Bob Mansfield, I trust. The lone star in Apple's executive bin. pretty much means we won't see a single thing about the apple car for at least 3-5 years. Oh, we'll see 3-5 years worth of rumors and analyst opinions (who's the one who kept insisting that Apple TV would have an actual screen? ), we just won't see any official comment for 3-5 years.